The Acropolis of Athens is the best known acropolis in the world. Although there are many other acropoleis in Greece, the significance of the Acropolis of Athens is such that it is commonly known as "The Acropolis" without qualification. The Acropolis is a flat-topped rock which rises 512 feet above sea level in the city of Athens. It was also known as Cecropia, after the legendary serpent-man, Kekrops or Cecrops, the first Athenian king. The site was inhabited as far back as 3000 B.C.E., and by the year 1400 B.C.E. had become part of a powerful Mycenaean city. Legend recounts that in the year 510 B.C.E. an oracle from the priestess of Delphi decreed that the Acropolis should no longer be inhabited by man and should remain the province of the gods forever more. Under the city-state ruler Pericles, a golden era in Athens began in the fifth century B.C.E. Athens was transformed into one of the most spectacular cities in the world. Taxes from all the other city states of Ancient Greece created a monumental home of the gods, including exquisite marble temples, which were embellished through the use of rich paintings, precious jewels, huge statues, and elaborate friezes. The centerpiece was the magnificent Parthenon, the temple of the virgin Athena who, according to Greek legend, won the city in a contest against the god Poseidon, gave her name to Athens, and was subsequently revered by the people of ancient Greece. The Acropolis was designated as a UNESCO World Heritage site in 1987, for its, "Illustrating the civilizations, myths, and religions that flourished in Greece over a period of more than 1,000 years, the Acropolis, the site of four of the greatest masterpieces of classical Greek art—the Parthenon, the Propylaea, the Erechtheum, and the Temple of Athena Nike—can be seen as symbolizing the idea of world heritage." 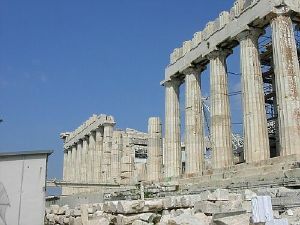 In 2007, the Acropolis was formally proclaimed as the pre-eminent monument on the European Cultural Heritage list of monuments. The Acropolis of Athens was inhabited by 3,000 B.C.E. and later served as a Bronze Age fortress housing the Mycenaean rulers. While the earliest artifacts date to the Middle Neolithic or Stone Age era (7500-7000 B.C.E. ), there have been documented habitations in southern Greece from the Early Neolithic era (8500-8000 B.C.E.). Once into the Bronze Age, there is little doubt that a Mycenaean Great Hall must have stood on top of the Acropolis, housing the local potentate and his household, guards, the local cult facilities, and a number of workshops and ordinary habitations. The compound was surrounded by a thick circuit wall, estimated at 14.8 feet thick and 19.7 feet in height, consisting of two parapets built with large stone blocks and cemented with an earth mortar called emplekton. Debris from the Persian invasion was ceremonially buried by the Athenians, and thus well preserved. The wall follows typical Mycenaean convention in that its gate was arranged obliquely, with a parapet and tower overhanging the incomers' right-hand side, thus facilitating defense. There were two lesser approaches up the hill on its north side, consisting of steep, narrow flights of steps cut in the rock. Homer is assumed to refer to this fortification when he mentions the "strong-built House of Erechtheus" (Odyssey 7.81.) It was during that time that an earthquake caused a fissure near the northeastern edge—one that ran all the way down to the marl layer in which water collected. An elaborate set of stairs was built and the well was used as a protected source of drinking water during some portion of the Mycenaean period, as it was invaluable in times of siege. A sizable temple, sacred to "Athena Polias" (Protectress of the City), was erected by the mid-sixth century B.C.E. This Doric limestone building, from which many relics survive, is referred to as the "Bluebeard" temple, named after the pedimental three-bodied man-serpent sculpture, whose beards were painted dark blue. Whether this temple replaced an older one, or a mere sacred precinct or altar, is not known. In the late-sixth century B.C.E. yet another temple was built, usually referred to as the Archaios Naos (Old Temple). It is thought that the so-called Doerpfeld foundations might have belonged to this temple, which may have been sacred not to Polias but to Athena Parthenos (Virgin), at least for as long as the Polias "Bluebeard" temple stood. It is not known how long these temples coexisted. To confuse matters, by the time the "Bluebeard" Temple had been dismantled, a newer and grander marble building, the "Older Parthenon," was started following the victory at Marathon in 490 B.C.E. To accommodate it, the south part of the summit was cleared of older remnants, made level by adding some 8,000 two-ton blocks of Piraeus limestone, a foundation 36 feet deep at some points, and the rest filled with earth kept in place by the retaining wall. The Mycenaean gate was demolished and replaced with the Old Propylon, a monumental colonnaded structure whose purpose was strictly ceremonial, rather than defensive. The Older Parthenon was caught unfinished by the invading Persians in 480 B.C.E., and was razed to the ground, burnt and looted, along with the Archaios Neos and practically everything else on the rock. Once the Persian Wars were over, the Athenians brought some order to the location, first by ceremonially burying objects of worship and art that were rendered unsuitable for further use. This "Persian debris" is the richest archaeological treasure excavated on the Acropolis, as its burial had protected it from further destruction through the ages. Artist's conception of the appearance of the Acropolis at the height of its glory. The height of Athena's monumental bronze statue is exaggerated. Most of the major temples were rebuilt under the leadership of Pericles during the Golden Age of Athens (460–430 B.C.E.). Phidias, a great Athenian sculptor, and Ictinus and Callicrates, two famous architects, were responsible for the reconstruction. During the fifth century B.C.E., the Acropolis gained its final shape. 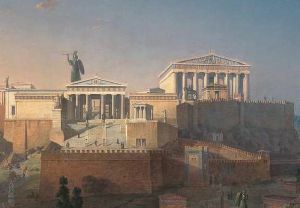 After winning at Eurymedon in 468 B.C.E., Cimon and Themistocles ordered the reconstruction of southern and northern walls, and Pericles entrusted the building of the Parthenon to Ictinus and Phidias. The Parthenon had eight fluted columns at either end and 17 on each side (these days often clad in scaffolding). The ceiling was painted blue and decorated with stars and a spectacular statue of the goddess, clad in a gold dress and bedecked with jewels, was erected on a pedestal in the inner sanctuary. The statue was lost after being taken to Constantinople in the year 426 C.E. In 437 B.C.E., Mnesicles started building the Propylaea, monumental gates with columns of Penteli marble, partly built upon the old Propylaea of Pisistratus. These colonnades were almost finished in the year 432 B.C.E. and had two wings, the northern one serving as a picture gallery. At the same time, south of the Propylaea, building of the small Ionic Temple of Athena Nike commenced. After an interruption caused by the Peloponnesian War, the temple was finished in the time of Nicias' peace, between 421 B.C.E. and 415 B.C.E. During the same period the building of the Erechtheum, a combination of sacred precincts including the temples of Athena Polias, Poseidon, Erechtheus, Cecrops, Erse, Pandrosos, and Aglauros, with its so-called Kore Porch (or Caryatids' balcony), was begun. Between the temple of Athena Nike and the Parthenon there was the Temenos of Artemis Brauronia or Brauroneion, the goddess represented as a bear and worshiped in the deme (township of ancient Attica) of Brauron. The archaic xoanon of the goddess and a statue made by Praxiteles in the fourth century B.C.E. were both in the sanctuary. Behind the Propylaea, Phidias' gigantic bronze statue of Athena Promachos ("she who fights in the front line"), built between 450 B.C.E. and 448 B.C.E., dominated. The base was 4.9 feet high, while the total height of the statue was 29.5 feet. The goddess held a lance whose gilt tip could be seen as a reflection by crews on ships rounding Cape Sounion, and a giant shield on the left side, decorated by Mys with images of the fight between the Centaurs and the Lapiths. Other monuments that have left almost nothing visible to the present day are the Chalkotheke, the Pandroseion, Pandion's sanctuary, Athena's altar, Zeus Polieus's sanctuary and, from Roman times, the circular temple of Augustus and Rome. Every four years the Athenians held a festival called the Panathenaea that rivaled the Olympic Games in popularity. During the festival, a procession moved through Athens up to the Acropolis and into the Parthenon (as depicted in the frieze on the inside of the Parthenon). There, a vast robe of woven wool (peplos) was ceremoniously placed on Phidias' massive ivory and gold statue of Athena. From the end of the Peloponnesian War (404 B.C.E.) until the first century B.C.E., no other important structures were built on the Acropolis. 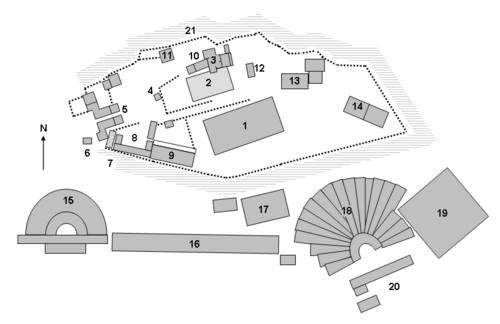 A small temple devoted to Augustus and Rome was built east of the Parthenon in 27 B.C.E. During Roman times, even though Greek sanctuaries were robbed and wrecked, the Acropolis retained its reputation as a proper place to receive offerings of the faithful. Following an invasion in the third century C.E., a new fortification wall for the Acropolis was built, with two gates on the west side. In subsequent centuries the monuments of the Acropolis suffered from both natural causes and human intervention. After the establishment of Christianity as Rome's state religion, and especially in the sixth century C.E., the temples of the Acropolis were converted into Christian churches. The Parthenon was dedicated to Parthenos Maria (the Virgin Mary). It was later re-named Panagia Athiniotissa (Virgin of Athens) and served as the city's cathedral in the eleventh century. The Erechtheum was dedicated to the Sotiras (Savior), the temple of Athena Nike became a chapel, and the propylaea an Episcopal residence. The Acropolis then became the fortress of the medieval city of Athens. Under Frankish occupation (1204-1456) the propylaea was converted into a residence for the Frankish governor, and in the Ottoman period (1456-1833) into the Turkish garrison headquarters. The Venetians besieged the Acropolis in 1687, bombarding and severely damaging the Parthenon, which then served as a munitions store. The British ambassador Lord Elgin caused further serious damage in 1801-1802 by looting the sculptural decoration of the Parthenon, the temple of Athena Nike, and the Erechtheum. The Acropolis was handed over to the Greeks in 1822, during the Greek War of Independence. After the liberation of Greece, the monuments of the Acropolis came under the care of the newly founded Greek state. Limited investigations took place in 1835 and 1837. In 1885-1890 the site was systematically excavated under P. Kavvadias. In the early twentieth century N. Balanos headed the first large-scale restoration project. 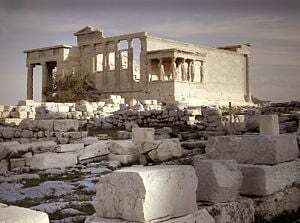 A Committee for the Conservation of the Monuments on the Acropolis was created in 1975 with the aim to plan and undertake large-scale conservation and restoration on the Acropolis. The project is still in progress. What makes the structure of the Greek architecture of the Acropolis remarkable was its sense of form and style, such that with simple construction techniques a profound balance was achieved that affects us to this day. These architectural forms are understood as representing status and refinement, and the decorations are always in exquisitely good taste. These design concepts result from their simplicity and their relationships, and the ideal they embody in the field of human expression. Embellishments involve simple plant and animal forms, and human bodies in a graceful expression of fluid space. For this reason, Greek architecture, epitomized by that of the Acropolis, is sill prevalent today particularly in government buildings and museums. The Acropolis and its works also embodied the Greek ideals of freedom and democracy. In the later fifth century B.C.E., Athenian statesmen were largely responsible for the full development of both the Athenian democracy and the Athenian empire, making Athens the political and cultural focus of Greece. Indeed, the idea of freedom of speech (for political purposes) became part of the private lives of its citizens. In a funeral oration in 430 B.C.E. for those who had fallen in the Peloponnesian War, the Athenian king Pericles described democratic Athens as “the school of Hellas.” Among the city's many exemplary qualities, he declared, was its constitution, which “favors the many instead of the few; this is why it is called a democracy.” By far, the most impressive examples of Greek architecture of the high Classical period were the buildings constructed under Pericles for the Athenian Acropolis. Besides the subtlety found in its design of Ionic and Doric orders, the architecture of the acropolis was, in several ways, a clear expression of civic pride based upon the foundation of a citizen's individual freedom inherent in the democratic city-state. The effect of twentieth-century technology and human intrusion have contrived to cause more damage than the Acropolis had suffered in the preceding two-and-a-half millennia. Fumes and pollution created by Athens' burgeoning population and constant traffic, the damage due to the landing and taking off of aircraft (now forbidden to overfly the Acropolis), and the three million visitors who climb up to the Acropolis every year, have worn down the surface of the rock and the marble facing of the monuments. Indeed, the marble itself has suffered chemical change and the surviving classical sculpture (e.g. on the west frieze of the Parthenon) is flaking away—all this at an alarming pace and on a disturbing scale. Accordingly, UNESCO set up a $15 million program to save the Acropolis. The first steps have been to lay a wooden gangway through the propylaea and to exclude the public from the structures flanking the Propylaea and the interior of the Parthenon. The caryatids (columns in a draped female form) have been removed from the Erechtheum—swathed during this process in scaffolding—and placed in the Acropolis Museum, where they can be protected from further damage. The Government website of the Acropolis. odysseus.culture.gr. Reconstruction of the ancient Acropolis. asclepieion.mpl. Acropolis, Athens UNESCO World Heritage Site. This page was last modified on 30 January 2019, at 20:39.